Last week treated us to a double whammy of Far Cry Primal and PvZ: Garden Warfare 2. This week is far more modest in comparison – every single retail release is a re-release of some description. The Legend of Zelda: Twilight Princess gets a digital dust off for Wii U, packaged with a fancy amiibo that unlocks a new dungeon. Nintendo has seemingly kept quiet that Australian studio Tantalus – best known for Funky Barn on Wii U and 3DS – handled this HD revamp. It’s not quite the random choice it initially seems, though – they recently converted Ubisoft’s ZombiU from Wii U to PS4/Xbox One. If memory serves, they did a cracking job with WipEout 2097 on Sega Saturn, too. Twilight Princess HD reviews went live yesterday, where it arrived to a mixture of 8s and 9s. The general consensus is that it’s a pretty straight-forward revamp but still a great game regardless. Over on PS4 Heavy Rain and last November’s Beyond: Two Souls are being bundled together for around the £30 mark. These are two games critics love and hate in equal measures – for every positive review, there’s a negative one. 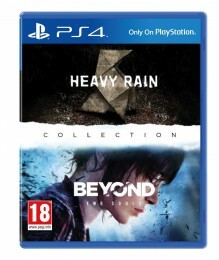 Things are no different now – Beyond gained 4/10 from The Metro while GameSpot gave it 8/10; Heavy Rain received 5/10 from Push Square and a lofty 9/10 from PlayStation Universe. What’s a gamer to do? Read as many reviews as possible, we guess. The law of gravity also applies to the top 40 chart – what comes up, must come down. Aliens vs Predator was #1 last week. It’s now at #2, knocked off the top by the heavily promoted Heavy Rain. It’s the first Sony-published title to take the top of the chart since Killzone 2 almost a year ago. Copies of Heavy Rain are also said to be in shortage, with more due to arrive in stores by next week. Sonic & Sega All Stars Racing is the next highest new entry at #8. It’s the Wii version that has been shifting the most copies, followed by Xbox 360 and PlayStation 3. Army of Two: The 40th Day is the week’s biggest faller dropping all the way from #10 to #30. Level 5’s RPG White Knight Chronicles is the only other new addition to the chart at #35. Konami’s hopes must be shattered – Silent Hill: Shattered Memories hasn’t made the top #40 although it goes in at #11 in the Wii chart and #5 in the PlayStation 2 chart. And no, that isn’t a typo – Konami have released it on PlayStatation 2 instead of PlayStation 3.